The Seagull S6 is Seagull’s most popular instrument to date. An instant classic due to its superior build, finish and feel for the cost, the original S6 splashed on to the scene with mass praise from guitarists worldwide, and has since been a basis for comparison for many. The S6 Original acoustic comes from the Seagull originals series, which offers all of the original Seagull designs, remade and re-polished to meet today’s acoustic guitarist’s most demanding needs. The wild cherry back and sides are solid and have a nice, less layered feel than the top, which has a bit too much gloss on it, resulting in a slightly less natural feel to the wood. However, the cedar is redeemable given that it is a wonderful piece, with few imperfections throughout. The finish on the S6 Original is, as mentioned previously, a bit thick. Seagull has picked up on other manufacturers’ trend of gloss coating the top of most of their production instruments. Whether this is to seal up imperfections in the wood, or to hide minor grain inconsistencies, the result still remains the same: the S6 Original will get sweaty, and at times sticky, due to its gloss coating, which can be a distraction to some. 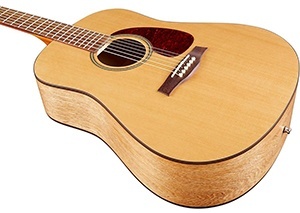 Further defining the sound, the top is made out of Cedar, overcoming the traditional use of spruce top. The result can be seen in tonal performance, which is in many ways different than that of a spruce top. This being said a player can expect a very different feel in comparison to standard acoustic guitars. While the saddle is one of the key components in determining the sound and performance of an electric guitar, it is of even more importance with the acoustic guitars. Electric guitar sounds are modified by amps and pedal effects, while the acoustic guitar relies on herself. 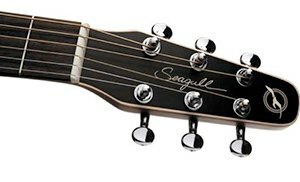 The Seagull uses a rather peculiar design called the “Compensated Tusq” which accentuates the sound on some strings to make the playability more enjoyable and full. Check out the video below for a great in-depth look at the Seagull S6 Original. Few acoustic guitars under a $1000 play very well. Those who would argue that an acoustic is an acoustic obviously just haven’t ever owned a higher end instrument–the feel and out of the box action on pricier instruments, though not completely justifying the inflated cost, is much better than that of a $300 guitar. Only, with Seagull, that isn’t always the case. Seagulls are often compared to Taylor guitars in terms of the feel and playability of them, not to mention the build quality, and for good reason; the Seagull S6 Original bridges the gap between two far spaced price brackets, and it does it very, very well. Seagull guitars are known for their bright sound. It is a great feature of the company and it is also, unfortunately, one of the company’s downfalls. The brighter tone of the S6 Original means that notes ring out clearer and longer, and that the notes in chords are more audible and more easily discernible. However, it also means that the S6 Original does not have very much bass to it, and for those who want a more bluesy sound, it also means that the guitar will fall short of your expectations. Sound is subjective; those who like brighter, more vibrant tones will love the S6 Original. Those who like deeper and richer tones will want to pass. Seagull S6 can also be purchased with electronics, but it’s less expensive to buy the acoustic one. The Electric model is called the “Quantum I”, and it includes three knobs for control over volume, treble, and bass. It also features a bonus feature - the onboard tuner. The reasons to choose the electric option is because of greater versatility, but it may be the case as well if you intend to play in areas that are usually noisy such as crowded streets or if you live in an apartment that is near a railroad or the airfield. Most customers found it exceptionally good and point out that its main attributes are phenomenal audio, outstanding feel, it does not go out of tune fast, and its consistency. If you are uncertain of whether this guitar is capable of suiting your needs, you should definitely check it out because there is still not a single unsatisfied customer of this majestic guitar. More than 160 reviewers agree to the statement that the Seagull S6 is the one acoustic guitar that they couldn’t let go after they have played it because of its quality and construction, resulting in the average of a 4,9 out of 5 possible stars. The only flaws that could be pointed out concern the cedar top, most probably because it helps produce the kind of tonality to which most people aren’t accustomed to. The reviews around the internet mainly scored positive, and well beyond average. It is proved that it suits both amateurs and seasoned veterans quite well, and it is highly recommended to try it out if you have not yet if you are a guitar player or intend to become one. The Seagull S6 has exceptional value and represents premium craftwork and design. It is not necessarily a beginner’s guitar, but it can’t be labeled as top-notch either. It possesses many qualities including exceptional sound, outstanding action, great durability, versatility, and playability, it’s very affordable and is worth every single cent. Guaranteed.